Why is it perfect timing? 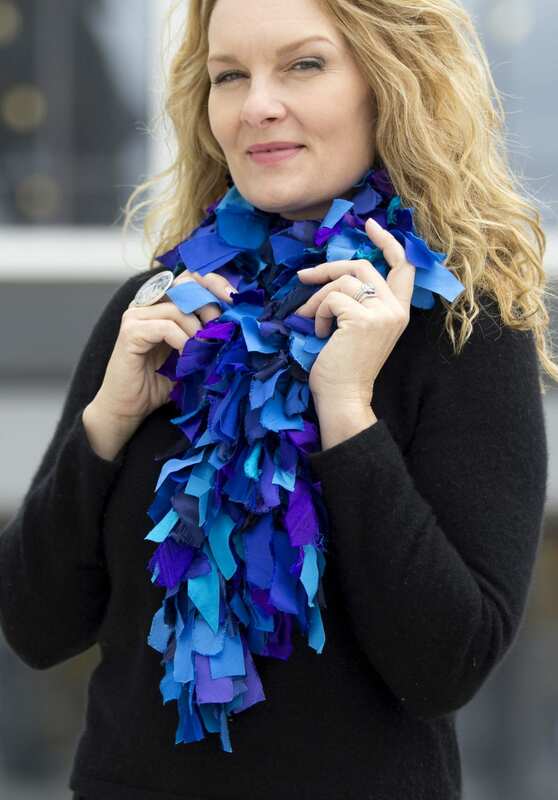 Fall will be here by the time we hold our annual art tour and this artist, new to Arts on the Credit: TOUR, creates gorgeous scarves just in time for the cooler weather. These unique and wonderful creations can be worn indoors or outdoors over jackets or coats. The artist I’m referring to is Helen Benninger, the queen of scarves. 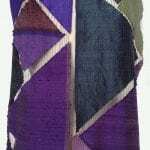 Much of her work is created from pieces of brilliantly coloured silk & put together is several different ways. “I am a maker. I need to make things! My tool of choice is a threaded needle,” says Benninger. Helen Benninger was fascinated by the sewing process from an early age, watching her mother and pleading to make things herself. She finally succeeded in convincing her mom to let her use her good old Singer sewing machine. Then it was on to university for a teaching degree, but Helen also began sewing costumes for a number of theatres around Ontario, including several seasons at the Stratford Festival. She discovered Rosemary Eichorn’s fabric collage techniques in a Threads Magazine, took some workshops & eventually was inspired to make her first fabric collage vest & later was inspired to create her ‘scrappy’ scarf. 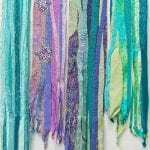 Helen always loved scarves & with an abundance of positive reaction from others she has continued to create & develop new scarf designs.